Have you ever had a conversation about books or movies and thought to yourself ‘When I get home I will search on my computer to see if I can borrow the book or movie from the library’, then when you get on your computer, you’ve forgotten the title or author? If you have a smart phone or tablet, I suggest that you download and install BookMyne. BookMyne is a mobile app that allows users to search and place holds on items contained within the Southern Tier Automated Regional Catalog (STARCat). The app is available on both Android and IOS (Apple) platforms. Go to the Play Store (for android devices) or the App Store (for iPhones or iPads) and download to your smartphone or tablet. How do I set up? 1. After installing the app, tap on “Find Library” toward the bottom of the screen. 2. Tap on your library from the list and then tap on “Add This Library”. 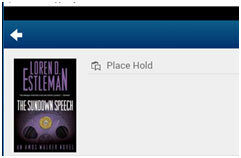 I’ve installed BookMyne, and added my library now what? Tap on “My Account” (you will be prompted for your library card number and PIN). Once logged into your account you can view and renew checkouts, view/edit/remove/suspend holds, and view fines and profile info. Can I search for books? 2. Type desired keyword(s) in the search box (1). 3. Tap one of the limiter fields (2) (Note: All Fields is the default). If you are in a bookstore, You can even scan the book’s barcode. 1. Tap on “Barcode Scanner”. 2. Scan the book’s UPC barcode with your smartphone or tablet’s camera. Can I place holds with BookMyne? 3. When prompted to select pickup location (this corresponds to the library you chose when you first installed the app), tap “Save”. 3. Tap on “Place Hold”. This entry was posted in Beneficial Bits n' Bytes, Technology, Uncategorized and tagged apps, beneficial bits n' bytes, BookMyne, catalog, searching, technology by ccld. Bookmark the permalink.